It is never so awesome before like this to play HD video on iMac 4K display! With 218 pixels per inch, the 21.5/27 screens feature 4096 x 2340 Retina screen(commonly referred as 4K), LED phosphor material KSF that boosts color saturation amazingly. The 4K screen makes it a good choice to watch HD video on iMac 4K. That's all? No. You'll hate its format limits, and where to download HD videos to iMac with 4K needs to be solved. In fact, all of these problems can be handled by a HD video converter for iMac like a hot knife through butter. 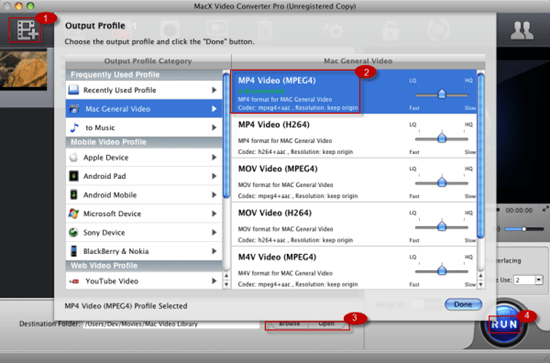 MacX Video Converter Pro can help you convert SD/HD/4K UHD/8K videos formatted MKV, M2TS, MTS, FLV, etc. to iMac best video format on macOS Mojave. The quality of original 1080P videos remains untouched during the conversion process thanks to High Quality Engine, and No.1 fast speed for its 3-LEVEL hardware acceleration tech. The program makes the HD video to iMac 4K conversion process 5× faster. It works smoothly on macOS Mojave or earlier. Follow the guide below to learn how to convert & watch HD 1080P/720P and even 4K video to iMac with 4K Retina display. Step 1: Free download iMac HD video converter for Mojave and run it on your computer. Click "Add File" button to import the HD video file you wanna convert. You can also download HD videos to iMac with UHD using the HD video converter, I will share the detailed guide later. Step 2: Choose output format. There's a specialized "Mac General Video" from the Output Profile Category, you can select "MP4 Video" or any other Mac supported video formats to play HD video on iMac Ultra HD display with no format compatibility issues. Step 3: Click "Browse" button to select a destination folder. Step 4. Click "RUN" button to start the conversion from MKV, M2TS, MTS, etc. to MP4, MOV, M4V etc. format accepted by 21.5/27in iMac. You are allowed to convert 1080p video to 720p on Mac, add subtitle, change aspect ratio, compress reduce video file size etc. The tool embraces HD video download on 4K iMac feature as well. You are free to download HD 4K videos, music, funny clips, Disney Bollywood Hollywood English Hindi Tamil movies for iMac 4K from 4K HD video resources provider YouTube, Dailymotion, Metacafe, Vimeo, 300＋ free movie download sites. With the help of its recording feature, you can watch HD streaming video on iMac 4K offline. It lets you capture streaming video on Mac from Amazon, Netflix, Hulu, any sites you can tell. It has never been so easier to watch 1080p video on iMac 4K. How to download 4K HD video from YouTube Dailymotion etc. on iMac with 4K display? Just copy and paste HD or 4K UHD video movie URL, and click "Download Now" button, the HD video converter & downloader for 4K Ultra HD iMac can do the rest for you. To view HD video on iMac 4K display, 4k video player helps a lot. If you are seeking for the best HD video player to watch HD video content on iMac 4K display, try the following top-rated video player. Note that they have input video format restriction, if you receive such message, resort to HD video converter for 4K iMac to convert the video first. You may never hear of it before. Yes, it's a newbie that was launched in 2015. But it is a godsend for 4K UHD iMac HD video playing. It plays 1080p video, also 4K Ultra HD videos movies with crystal image presented without freezing and formats limits. It is able to play HD videos of MKV, AVI, MOV, FLV, MTS, AVCHD on iMac 4K, to name just a few. It supports you to airplay HD video from iPhone, iPad, iPod to iMac 4K and Mac to Mac. No spyware, no virus, no plugins. Mac users will be familiar with this HD video player for 21.5-in iMac with UHD display. First off, it is simple to use. HD video streaming on 4K iMac is supported. It is significant to notice that third party help or plugin is required to play AVI, MKV etc. HD video on iMac 4K. Alternatively, you can convert HD video on 2160p iMac first and import to QT. Free version has limited function, only pro version can do the video editing task.